1. Each rectangle has to be painted with one color. 2. A pair of intersecting rectangles must have the same color. Two rectangles are intersecting if their intersection is not empty when we regard a rectangle as a set of points including the boundary. 3. 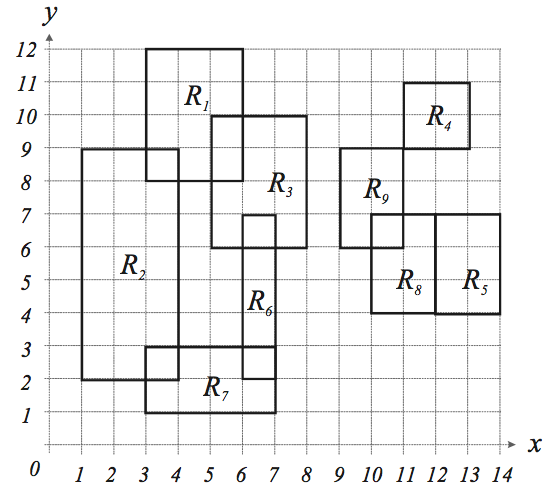 A rectangle Ra must have the same color as Rb if there is a sequence of rectangles Ra = Ri1, Ri2, …,Rik = Rb such that Rij and Rij+1 are intersecting for all 1≤ j < k ; otherwise, they must have different colors. For instance, rectangle R9 in the following figure must have the same color as R4, R5, R8, and have a different color from R1, R2, R3, R6, R7. The input consists of T test cases. The number of test cases (T) is given in the first line of the input file. Each test case begins with a line containing an integer N , 1≤ N ≤ 200 , that represents the number of rectangles in the test case. Each of the following N lines contains four positive integers x1 , y1 , x2 , and y2, 1 ≤ x1,y1,x2,y2 ≤ 10000 , representing a rectangle. (x1 ,y1) and (x2 , y2) are the (x, y) -coordinates of the lower - left and upper -right corners of the rectangle, respectively. The four integers are delimited by one or more spaces. From the N +3 -th line, the remaining test cases are listed in the same manner as above. The output should contain the number of colors, one per line.